Another year has passed by - spinning rhythmically like the motion of a Carousel. Seems like a minute ago, the ride began and now its time to stop. What happened to our space and time? We didn't even hear the music gently turning the merry-go-round. Look back and remember how it all went by. Freshmen registration - the newness of everything turning around us, the excitement and the spirit that only a beginning class possesses. The first football game we went to - the crowds, the socializing and the people shouting "Leuzinger's No. 1". The after game dances, building banners and making costumes for the Homecoming Parade. The crowning of Homecoming Queen, the Snowball Queen and the Sophomore Sweetheart. The unbearable suspense felt as the winner's name is taken out of the envelope and the moment of elation as the queen received her crown. The overwhelming pride felt when we first wore our class rings. The activities, clubs and athletic competitions. The Student Council skits that were always pathetically funny. The fantastic Julianos submarine sandwiches and the marriage booth at Spirit Week. The lunchtimes spent with friends sharing secrets the entire school would somehow end up knowing, the pranks and the laughter, the planning of the next T.P.-ing of Senior Square. Student Council elections, favorite teachers, and psychology classes. The times we ditched and were never caught and the first time we did get caught. Senior Ditch Day - the notices warning us to be in school. Funny how all Seniors suddenly become ill on the same day. Graduation announcements, the caps and gowns. The Senior Prom - enveloped in misty glances, tender promises of everlasting friendships, and uncertain hopes of what's to be. Senior pictures, soon to become tomorrows' souvenirs of yesterday's close friendships. The uncontrollable thrill as you finally receive your diploma. The tears, cried by your parents and friends, amid congratulating hugs and kisses. And finally, Grad Nite - the last chance to see everyone and pledge to get together soon... a last chance to look back with all your friends, and smile at all the things that were done and said throughout the past four years. The last chance to realize we must leave a part of ourselves behind. And the CAROUSEL begins to turn once more, spinning swiftly for the next four years, and turning slowly in the warmth of our remembrance. 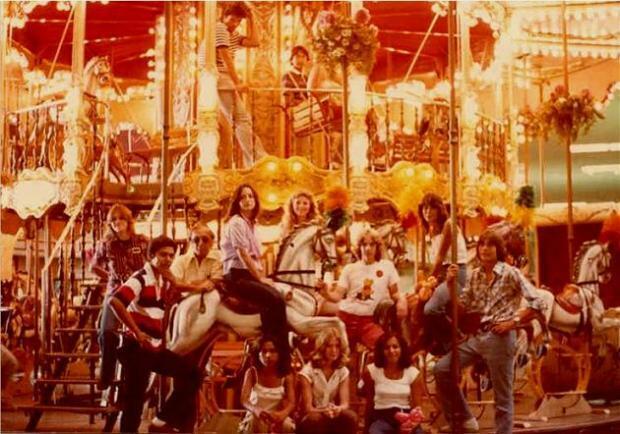 The CAROUSEL forever turns on the vastness of our memories.